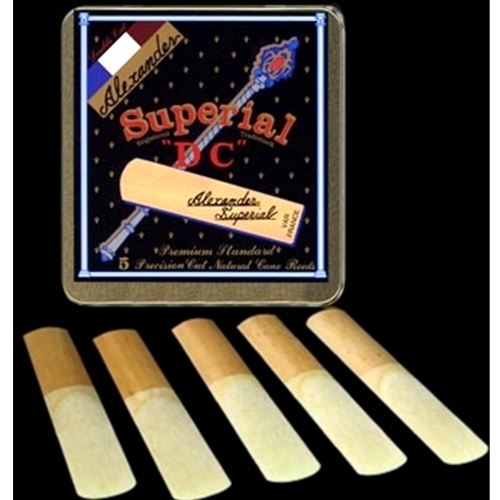 Alexander Superial "DC" - Baritone Sax Reeds No.2.5 From the Alexander website After introducing Superial, I wanted to add another model to our line which I thought might meet the needs of players who were looking for a different style cut and tonal response. Using the same cane, we made exhaustive tests and alterations to fabricate a reed with somewhat changed response characteristics from the original Superial, and thus the new Superial "DC" (or "Double Cut) was created. This reed has a slightly harder tip and more wood in the heart and sides than Superial and therefore produces a more solid tonal core, enhanced projection and power, and a little darker harmonic timbre than Superial, but still one with the kind of "edge" and authority needed in soloing or lead work. For "DC" I was thinking in terms of a tonal concept reminiscent of the saxophonists I had admired and been influenced by from the 1950's to the "Blue Note", "Miles" and "Trane", and "Wayne" eras. I also had in mind a reed of increased power that would be particularly suitable for big band, stage band or marching reed players, as well. So in a sense, I worked on "DC" with an idea of making a reed that fit closest to the tonal palate of my own musical influences and this became the reed I used on Tenor most of the time. Since its introduction in 1995, "DC" seems to be especially favored by professionals who need a lot of power and want to push the reed to the limits of its dynamic capabilities, while still retaining an even balance from top to bottom.